The goal for the upcoming holiday season should be to get everything done in a reasonable amount of time so that you can actually enjoy the holidays. Is always so much going on between planning meals, coordinating with the family and all the gift shopping that you barely have time to catch your breath. Although people who do their holiday shopping early are often mocked, they are actually on to something. Imagine getting done all your Christmas shopping before the Thanksgiving turkey goes into the oven. That would be a major accomplishment. There’s some other things you could do around the house to get ready for the holidays in the coming week. That can start with getting all the unwanted junk removed from your home with a call to Junk King Hudson Valley. Hiring Junk King is like hiring your own private work crew. Unfortunately, this crew can stay with you all day long to hang up decorations but they can certainly clear the way shows up all you have to do is point to the things you want taken away. Don’t think about something being too heavy or oversized. Let the Junk King Hudson Valley team worry about that. There are great problem solvers and are terrific when it comes to lifting heavy objects. All you need to focus on is deciding how many things you want taken away in a single session. There are many satisfied Junk King customers who will bring back the crews several times to get it all the things they want to get rid of. Nothing wrong with that! Everything you turn over the Junk King will also have a chance to be donated to a charity. 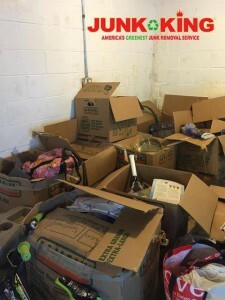 Don’t worry about what kind of condition something might be in or whether you think it is “outdated.” Those things aren’t an issue for any of the charitable organizations that Junk King Hudson Valley is part with. They are happy for the donation. And it should make you happy knowing that none of your stuff will go to waste in a landfill. The best way to start your holidays is in a house that’s free of junk. Junk King Hudson Valley can make that happen. This entry was posted in Hudson Valley Junk Removal and tagged holidays, junk, Junk King, junk removal on October 31, 2017 by Junk King. Last updated October 31, 2017 .